Ys III: Wanderers from Ys (イースIII -ワンダラーズフロムイース-, Īsu Surī -Wandarāzu Furomu Īsu-?) is an action RPG developed by Nihon Falcom Corporation. It is the third game in the Ys series. 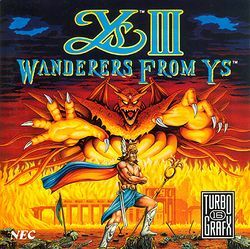 Ys III was initially released for the NEC PC-8801 and NEC PC-9801 in 1989, and versions for the MSX2 and Sharp X68000 soon followed. In 1991, a number of console ports were produced: versions for the TurboGrafx-CD, Famicom, Super NES, and Sega Genesis. A port for the PlayStation 2 was published by Taito Corporation in 2005. The TurboGrafx-CD, Super NES, and Genesis versions, as well as the PSP and Steam version of the remake, Ys: The Oath in Felghana, have received official English-translated releases. In addition, the NES and MSX2 versions have been fan-translated. This page was last edited on 7 September 2014, at 02:20.